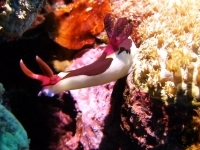 White body with red to brown saddles behind the rhinophores and gills, blue margins along the foot and mouth. 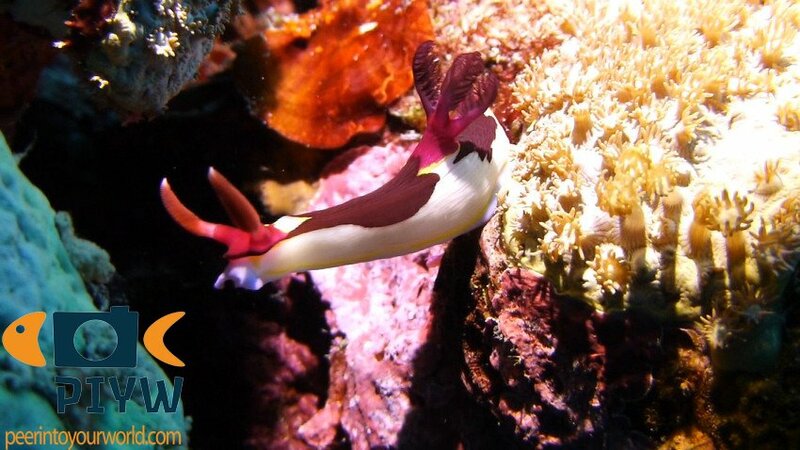 The rhinophores and gills itself are deep red to pink and the color extends onto the body. It shows resemblance with N. purpureolineata and N. aurea, and is sometimes misidentified. Unassessed by the IUCN Red list. Uncommon species with a limited habitat. Indo-Pacific; known from Indonesia and the Philippines. They are often found on or near ascidians. Eggs are laid in a gelatinous yellow egg ribbon, coiled up into a counterclockwise spiral. They feed on ascidians of the Rhopalaea genus and Clavelina genus.